I use a clicker training method with Henry, so I will be referencing it in the steps. 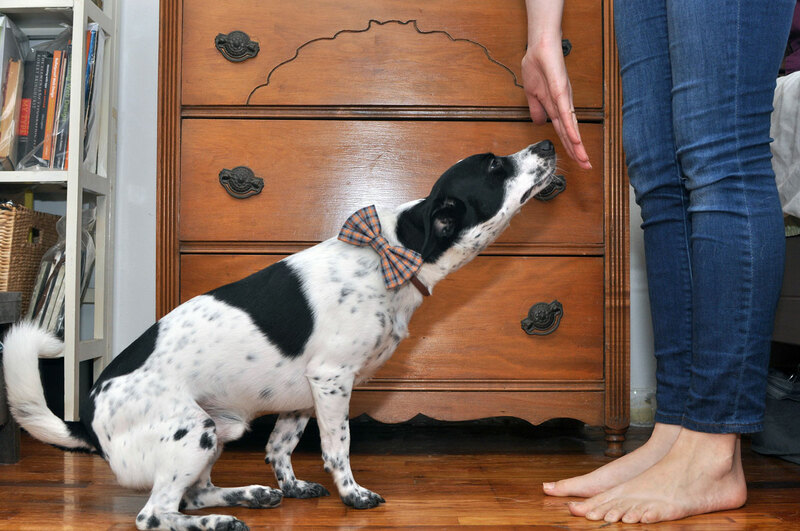 Clicker training is very useful to help a dog understand exactly which moment he is doing the correct behavior. 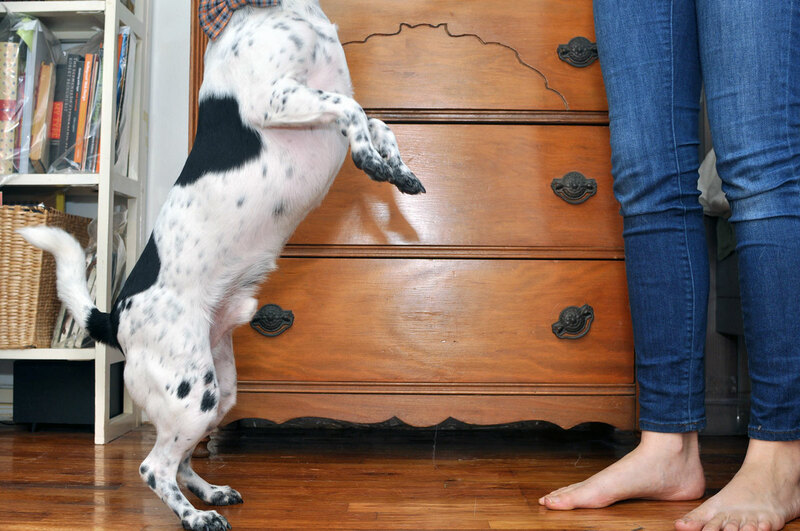 You can learn more about clicker training here. 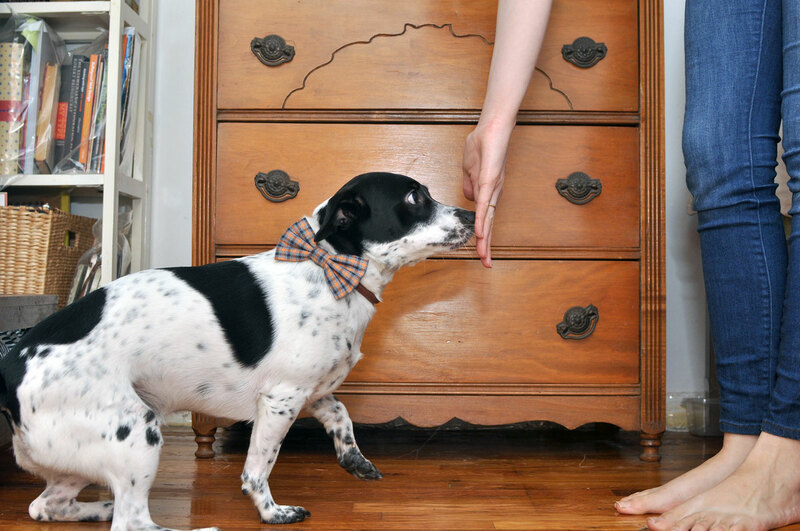 Alternatively, you can use a single word such as “YES!” to mark the moment your dog performs the behavior. First, you dog needs to get used to touching your palm with his nose. Present your hand to your dog, holding it flat with the palm facing him. When he sniffs or investigates it, click or say “YES!” and give him a treat. If you dog needs a little bit of encouragement, consider smearing a little peanut butter or cheese on your hand to entice him. Put your hand behind your back so that your dog can’t see it and wait a second. Present it again, and reward your dog when he sniffs or investigates it again. Repeat this several times until your dog associates seeing your hand with touching your palm. When he is touching your hand reliably, you can add in the command “TOUCH.” Keep practicing until he will touch your palm with his nose whenever you present your hand and give the command. Remember to keep rewarding your dog! 4.) Make It More Challenging! 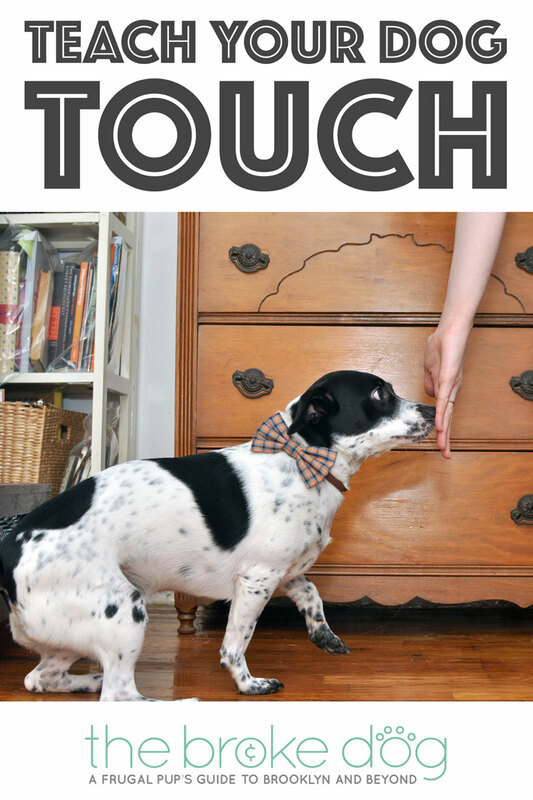 Start asking your dog to “touch” from further distances so he has to walk a bit to reach you. Increase the distance he has to travel little by little until he has to travel across your apartment or house. If you practice and strengthen it enough, your can use “touch” as a recall. 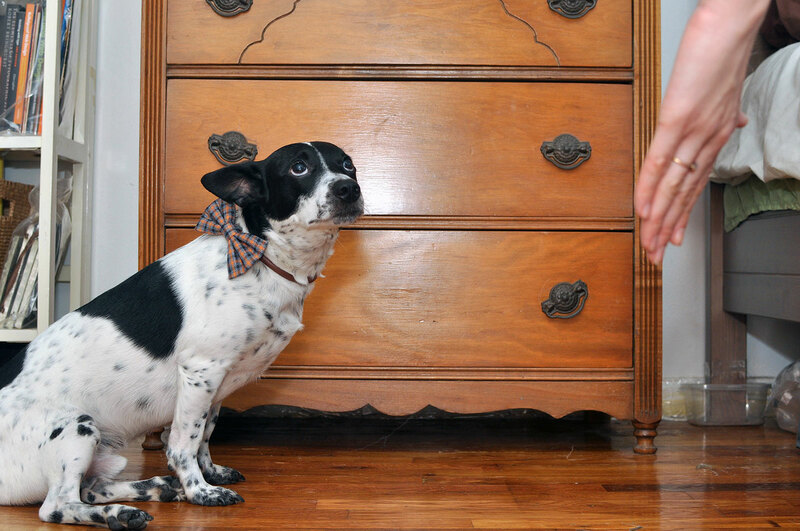 Keep it fun and rewarding, and your dog may drop whatever it’s doing to come “boop” your hand! You can have some fun with this, too! I like to present my hand to Henry at all different angles and heights, challenging him to spin and jump to reach it. He loves it and we have a lot of fun! Pretty easy, right? Many dogs can learn this trick quickly. This was one of the first things I taught Henry after I adopted him, and I used it as a bonding exercise as we got to know each other. 1.) It’s so important to keep training fun and positive for you and your dog! If he makes a mistake, consider saying “oops!” instead of “no” to keep things light and happy. He will love working with you if he has a good time! 2.) Try to keep training sessions short and digestible — Henry likes to work in ten-minute chunks — to keep your dog from getting bored or frustrated. 3.) End on a good note! Make sure everyone walks away from the training session feelings great by ending it after your dog successfully performed the behavior. Now that we’ve learned a “TRICK,” it’s time for some “TREATS!” Use the widget at the end of the post to enter for your chance to win some great prizes, and visit each participating blog for your chance to learn a new trick and enter additional times! Giveaway is open to the US and Canada and ends 11:59PM PST on 10/30/16. GRAND PRIZE: $300 Gift Card to PetSmart. SECOND PRIZE: Sponsored by Caru Pet Food. Prize is a 14 bag assortment of Caru’s Soft ‘n Tasty Baked Bites and Baked Bars. Estimated value is $100. THIRD PRIZE: Sponsored by Nature’s Logic. Prize is 1 bag of canine beef lung treats, 1 bag of canine beef liver treats, and 1 bag of canine beef tendon treats for 3 lbs of treats in total. Estimated value is $80. FOURTH PRIZE: Sponsored by The Honest Kitchen. The prize pack will include the new Nice Mussels plus Wishes, Pecks (8 oz), Beams (7 oz), Quickies, and Smooches (16 oz). Estimated value is $72. PLUS: Follow all participating blogs on Instagram for your details on how to win a $20 PetSmart gift card and a bow tie of choice from Brooklyn Bowtied! we don’t know this particular trick yet, but they know a variety of other cute tricks! Cool! Which ones? I’m always looking for new tricks to teach Henry! The touch command is, so far, the only trick I’ve been able to teach Dipper aside from sit and (sometimes) stay! I find it’s extremely useful for times when I’m trying to redirect his attention or to get him to go near something new and unfamiliar. I taught the trick with a balled first rather than my open palm. I had the hardest time getting him to even come near my hand, fist or otherwise, because he’s so cautious. I had to put a treat he could smell in my hand for it to work. Awww Dipper! Great job to Dipper, too! Nice! My dog knows this trick with two fingers, although I don’t have a verbal “touch” command. We’ve been looking for another trick to teach Abby, and this might be it!! I have three rescued Treeing Walker Coonhounds. None of them know this trick, but I think I’ll try to teach it to them. The pooch in the photos is adorable, by the way. Thank you! 🙂 That’s my Henry! Good luck with the Trick! My dog does know this trick. At the moment we are working on using this trick to teach her to turn off the lights. Yes, we know to touch Mom’s hand. It often means a treat or a scratch. My dog doesn’t know that trick yet, but now i will teach him! Thank you! we don’t know this one but it might be a great one to teach! Yes my dog knows this! This was one of the lessons we learned in puppy class actually as part of an intro to obedience. very cute! we don’t know this one! Yep, I taught my dog this trick using a similar method. These look fun and pretty easy… thanks! Georgia is learning this trick right now! Yes. I forget if I taught him to it separately or if it was part of his agility class. One of my dogs gives us ‘high fives.’ We tried to pick tricks our dogs seemed to want to do naturally, and then reward them when they did them to reinforce them. Cool though! That’s great! That’s how Henry and I ended up learning “spin” – he loves to do it! Are there any practical uses of this trick besides just bonding? I’ll have to try it out. I can be used as a recall if you really perfect it, and it’s great to help center and focus a dog that’s distractible. Henry can be reactive with other dogs on walks, so I’ll use “touch” to draw his attention away from an approaching dog. Nala and Cody don’t know this trick but Nala loves to nudge people so she would probably be a quick study. I have 3 dogs and none of them know this trick. we just worked on this the other night! Its a great trick for all pups to know. Our malamute does not know this trick. My dog barely knows one trick… the one trick she knows she mastered— SLEEPING. Delilah is reactive around certain dogs. I carry treats to help distract her, and I use LOOK to get her to focus. I like the idea of touch too, just for something different, to keep her on her toes. 🙂 Thanks for sharing this trick! My dogs do not know this trick. It would be interesting to see if they can learn it. Both my dogs know touch- very useful in agility training. My dog knows paw up. He will put his paws where I point, but he doesn’t know the touch command. No, my dog doesn’t know/wasn’t trained it… i don’t really see a point to it? Looking so dapper, Henry! Touch is a great trick to teach with some practical uses. I incorporate it to reposition Ruby for other tricks! Nope, our dogs don’t know this trick. We need to get busy! I’ve never seen this trick before and it looks like one my dog could easily learn. Thanks for the easy directions to follow! My dog does not know this trick. He is just a puppy. You know my one dog learned this in school, but we never practiced/keep it up after she graduated. Yup! My dog knows this trick. My dogs do not know this trick yet. You make it look so easy that I think we will try it. My dog does not know this, but I am going to try teaching it to him as he gets distracted when we are walking in town. We’ve used touch as a way to learn other tricks, but never really by itself. It’s a great idea to use it for recall or keeping attention when on walks. I think I’ll add it in for those too, since Luke is also reactive. Henry is so cute, and his coloring reminds me so much of our Luke! my middle child was partially trained using the clicker and she learned a lot. i have not used it in a few yrs so dont know if she would remember, the clicker, touch, come, stay, etc. but she does does a lot of this anyway. i have not tried the touch method though. So cute love to try this with our 3 dogs looks like fun your dog did it well! No my dog doesn’t know this trick. It looks like it can be done though. Oh I love your method to teach! I need to try that and see how it works on our dogs. They really just know how to sit, but would love to start teaching them some new things. My dog does not know this trick but would be able to learn it. My dogs do not know this trick~I am going to have to see if they can learn it too. We haven’t worked on this one yet. We are going to though! Thanks for sharing! I have a puppy so will try this trick with her. Haha cute! 🙂 Henry is weird about his feet, so I haven’t had luck with “paw” yet! My little pomeranian knows this trick, along with many others. She is getting much older now and has arthritis, but she still can do and remember a lot of the tricks she has learned growing up. I appreciate the information. I learned a few things from it. Henry is so cute!! I don’t have a dog but I have a cat who likes to play fetch lol! My brother’s dog is kind of unruly so teaching her a few commands or tricks would probably help with that. I’ll have to show him this! Thank you! No, my dog doesn’t know that trick. Would come in handy though. Thanks for sharing. This was the second thing our little adoptee learned after SIT! Yes this is actually one of the tricks my dog can do!! I did it pretty similar to the way you listed in the blog. We rescued our dog from the humane society when she was about 1 1/2 years old and she’s a lab so she’s a pretty fast learner!! We are very blessed to have her as a member of our family!! he doesnt, but always looking for new tricks to try! The only trick my dog knows is how to follow me everywhere and beg for attention. My dog knows a few easy tricks but I never thought to teach her this one. Great tips and I’m going to see if my dog Shelby can get this one also! Thank you! Don’t know this trick yet. I’m teaching this to our Great Dane Chomper when I get home! No, I haven’t taught him this one yet. We have a new puppy and haven’t taught him any tricks yet but we will try this one! My Boston knows this, taught pretty much the same method. Yes both my boys know the touch command.. Cool trick. I’ll have too see if my girl takes to it. My dog doesn’t know this trick in due time! Our dog Bo can sit and shake. He also loves to stand up and hug you. If it involves a treat, my dog knows the trick to get it. That’s how I teach him most everything — with treats! It’s the one trick we haven’t mastered yet. She always thinks there’s food in my hand. We’ll keep working on it. All 3 of my dogs can touch their cold wet noses to my hand, and I used clicker training to get them to do it! my dog doesnt know this trick..she knows how to sit ! my dog knows nothing, but to eat everything in sight. Great. I’ll have to try that! The only tricks my two know is sleep and sit. My golden doesn’t know this trick but he knows sit and lay down ! We got a rescue in January and we are trying to teach her how to roll over. She learned how to sit. Our dog doesn’t know this trick, but he knows a few other ones. I’m very blessed. I took in a stray that at one time they must have loved and trained but later they weren’t very nice to him. He is sweet and does know a couple tricks. They do not know this one, how cute! My dog does know this trick. I’m now teaching it to my other dog that I took in because my neighbor could not care for it. i HAVE NEVER HEARD OF THIS TRICK UNTIL NOW. She has learned it. She’s really smart and eager to please. beau is young, and we haven’t had hil long, so no tricks yet. He is smart, so I think he will pick this up quickly. My girl does not know this trick. I am going to try teach her. My little gal does not know this trick. She’s physically limited. Oh, and Henry is JUST adorable!!!! Thank you!! 🙂 Thanks for entering, too! Tucker doesn’t know that trick per say. He somewhat knows it. It’s a skill in progress. I was unaware of the name up til now. My dog is turning 12 this Halloween, what a great gift for her. She’s a well trained dog and would love a new one to learn. I use this for redirect on walks! Mine knows it! I use “yes” as the marker. My dogs know touch. We first started with a touch stick first. This is such a great idea I will definitely try this with both my pups ! Can’t wait to start! Yes, Toby does know this trick but my son taught him differently. We don’t really do this as a trick, but it’s sort of an automatic for my dog. Not sure why, but she’s a rescue, so maybe someone else taught her? I have not specifically taught this trick. But if I hold up my palm, my dog will come touch it if it is at a level she can reach. She was a pre-owned rescue though so maybe her previous owners taught it. They taught a lot of manners. Awesome Post! Love the “touch” trick. It’s just so useful, people don’t realize how useful it is. I used to teach this in my dog training classes and it was so fun because the dog would learn it so quickly. I love it to re-focus my Jack Russell. It helps him a lot to do an easy game to bring the attention back to me. Thanks for the post, love all you do! No dog. I’d love the gc and any treats, etc would go to my local shelter. Great trick! My cat can do high five – that’s kinda close. My dogs do not know this trick. I am enjoying learning about lots of new tricks though! No, my dog doesn’t know this trick. Definitely going to work on touch with Temo after seeing how amazing Henry was at it today!! lol!! My baby girl doesn’t know this one. My dog does not know this trick but I can see how it would be very good for her to know. My dog doesn’t know any tricks, his skills end at sit.